The rear interior lights in our Airstream mysteriously stopped working yesterday morning. We checked all seven 12 volt circuit fuses and tried shaking the trailer. Nothing would make the lights turn on. Failed were the bedroom ceiling lights, the bed reading lights and rear roof locker, and the bathroom exhaust fan. And, oddly, both closets’ lights and the bathroom vanity lights still work. My pollyannish partner, as usual, said not to worry about it. “We’ll fix it” is her characteristic, and always correct, answer. Still, all day I was bummed and unreasonably worried about how I would trace the open circuit and repair it. This morning we pulled the rear wall switches. We found, as expected, no power to the involved switches. I temporarily jumped 12v power from an adjacent working switch (the vanity lights). Bingo, everything worked again. Okay, the simple solution is to create a cross-connection from the yellow circuit (still works) to the purple circuit (lost its power supply). I grabbed materials to make a splice from yellow wire and refeed yellow and purple. The 20 amp circuit wiring and fuse would carry everything we’d use at one time. a purple wire in the refrigerator outside cabinet. It seems most all the 12v wiring runs through this area. Sure enough, there’s the purple wire going into and out of a molex plug. 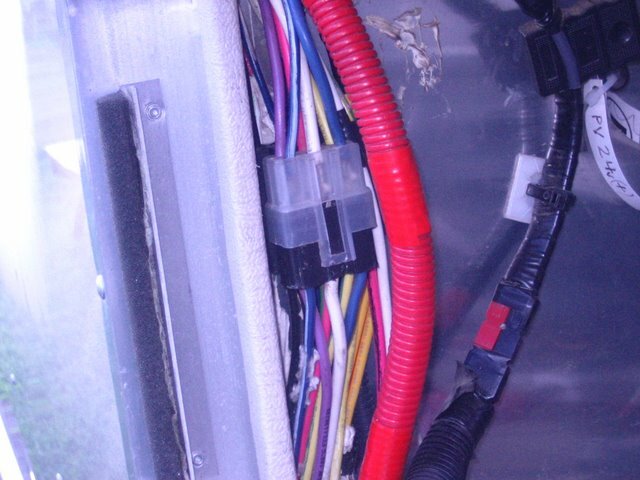 I pushed each of the purple wires into the plug and rechecked inside the trailer. Bingo! Problem solved. Apparently the purple wires shook a little loose with the rough I-5 roads we traveled last week. Guess where I’ll check first next time?